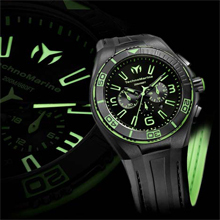 For the young, urban night owl, TechnoMarine introduces the new Night Vision. Elsewhere on the watch, discreet splashes of color—along the side of the bezel and on the inner layer of the strap—are visible only to those that are in-the-know. 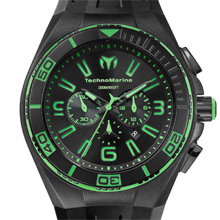 Like the man who wears it, the Night Vision is subtle, sharp and supremely confident. It’s inconspicuous, but always stands apart from the crowd. As the evening’s escapades unfold, lead the way with the Night Vision. Size: 45 mm / 1.77 in. Water resistance: 20 atm / 200 m / 660 ft with a screwed crown that guaranties a perfect sealing. Case: Stainless Steel 316L, Black PVD coated. Bezel: Stainless Steel 316L, Black PVD coated, rotating unidirectional. 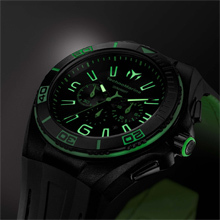 Dial: Black with colored super luminova indexes. Cover & Strap: Black cover, black and colored silicone strap. Buckle: Ardillon buckle, Stainless Steel 316L, Black PVD coated.